This year’s new crop at the Meehan Homestead will be cactus. It is the latest step in the gradual New Mexication of our landscape that Marsha and I have been nurturing over the past few years. There are a couple of reasons for this horticultural mode of travel. First, New Mexico is where we ultimately plan on living – but until then we will make do by bringing as much of that locale into our immediate surroundings as we can. We began with our family room, which fittingly sits in the southwest section of our casa – note the subtle introduction of the Spanish motif – the walls of which are decorated with various arts and crafts from “The Land of Enchantment” that we have acquired or been given over the years. 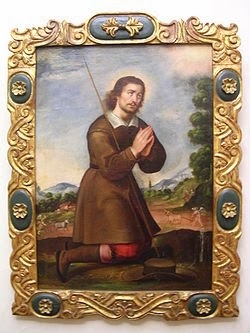 Among them are three “retablos” (paintings on wood) of San Isidro Labrador, the patron saint of farmers and gardeners who, according to legend, was discovered by his master praying while an angel was doing the ploughing for him. While I am certainly not spiritually in a place to deserve any divine yard-helpers the religious icon’s presence nonetheless inspires me to emulate to a lesser degree some the Madrid native’s horticultural feats. Which brings me to our second reason for New Mexicizing our local terrain – if ordinary mortals in one of the most sun baked and arid areas in the U.S. of A. can grow this stuff – then why shouldn’t we, sitting here in the rich, deep, alluvial soil of the Connecticut River Valley, be able to grow them even bigger and better. 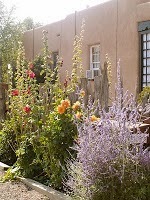 We started with hollyhocks, which, while certainly not unique to New Mexico, nonetheless have gone on to become the floral symbol of the town of Taos and proliferate the southwest countryside throughout the summer and fall. Depending upon whom you choose to believe this colorful cousin of hibiscus, okra and cotton was brought to the region by either the daughter of the territory’s first governor who purchased them from a St. Louis seed salesman or, Sueño, a near-sighted angel, who while escaping Herod's wrath took the Holy Family to New Mexico by mistake. Either way, they are like-everywhere out there. Actually even that's an understatement. I would say that you couldn't swing a dead javelina in Santa Fe without hitting one of these drought-tolerant, heat-loving members of the mallow family. We got some seeds from our daughter-in-law and son’s front yard in Santa Fe and planted them in our first potentially faux New Mexico garden. Year uno – nada. Year dos – more seeds followed by more and more and more rain. Mucho agua = drowned hollyhocks. Year tres – the rains held off and the ‘hocks soared. Last summer – not so good. But hope is an integral part of gardening, especially with hollyhocks. Next we added “Maximillian Sunflowers” (this time from our d-in-l’s backyard and harder to smuggle x-country) – another perennial (more reliable) that also can withstand poor soils and intense heat, and churns out large yellow flowers from midsummer onwards. And tall. Like really, really, tall. Like cut them back in June, then August, and in September they are still eight feet high tall. No problemo with these southwester imports. Now New Mexican cactus is not showy and big-limbed like the steroidal, tree-like saguaro that can grow up to as much as seventy feet in the Sonoran desert of Arizona. 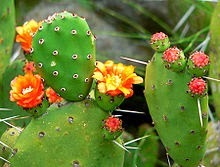 Instead it is the considerably more modest prickly pear – short plants with flat, rounded cladodes (also called platyclades) that are armed with two kinds of spines; large, smooth, fixed spines and small, hair like prickles called glochids, that easily penetrate skin and detach from the plant. Only this time Marsha and I are not planning on secreting these paddle-like cacti in our carry-on luggage – those pointy needles can be a real turn-off, trust me – and we probably won’t be going to NM until after the CT growing season anyway. Instead we are going to sell out a little and seek the plant locally. Or so we intend anyway. Sometimes when New Mexican Catholics don’t get what they want after praying to their retablo saints they put the icons in a drawer or out of sight in some other place to express their anger. So should you drop by our house this summer and you notice three San Isidro plaques hung with their faces to the wall – don’t even ask me how our prickly pear project went. 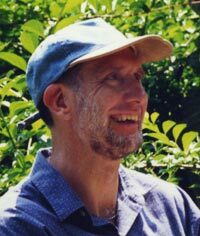 On the other hand if Isidro’s unsmiling face is looking you square in the eye (saints never grin after all) then you are welcome to visit our latest little bit of NM in CT.